This has become a major national story the main function of which appears to be to enrage those who believe that the U.S. should be an English-only language. The better question is: Does this lawsuit have merit in a legal context? Today, based on lawsuits in the past, theme parks do post information concerning the potential dangers of the ride. They have a tendency to list the conditions that could make the ride dangerous and these warnings absolve them of liability in terms of injuries caused to those that have those conditions. How do they do that? Well, in terms of an amusement park liability lawsuit, the park, by warning patrons of the potential dangers ensures that they are aware of any potential injuries that they can receive. In other words, if you have a heart condition and you go on a rollercoaster, it’s not the park’s fault if you have a heart attack. This is also basic common sense. But what happens if, for some reason, you couldn’t read the sign in order to heed the warnings? Would you have a suit against the park based on a failure to warn? 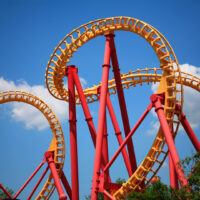 It is true that the park could reasonably predict that a rider of an amusement park ride could reasonably predict that there would be those who would ride the ride without being able to read the sign. Many amusement parks, especially those in Orlando Florida, get tourists from all over the world. These tourists, like American tourists enjoying attractions abroad, may or may not be able to speak the native language to the extent possible in order to understand the warning. The question then becomes: To what extent does the amusement park have a duty of care in this case. That injuries resulted from that failure. The park will likely argue that they met their duty of care by making the information available in English. They will also argue that they had no duty to make the information available in Spanish or any other language. The attorney for the plaintiff, however, has noted that Orlando is the number-one tourist spot in the country and that nearly a quarter of Florida’s residents speak a language other than English at home. The attorney believes that the park has a duty both Spanish and French speakers who they can reasonably predict will be visitors to the park. Who will win? It’s hard to say. It will depend heavily on the sentiment of the jury toward the plaintiff. In the current cultural climate, it could be a tough sell. Then again, a good personal injury attorney can make a persuasive case that this family deserves compensation. The Miami legal team at the office of Alan Goldfarb P.A. helps injury victims recover damages from negligent parties. Give us a call or talk to us online to set up a free consultation. http://Should EA Sports be Responsible for the Madden Shooting in Jacksonville?